Home > Notions > Aleene's No Sew Glue 4oz. 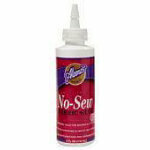 Aleene's No Sew Glue 4oz. Ideal for quilt basting, temporary stitching, hemming or any craft where you need a permanent hold until washed Formulated to dry clear.